Have you ever considered adding a pool or spa to your backyard, how awesome it would be to have a spot to chill out during the summer heat? It sounds great, but is it feasible in reality, how much would the maintenance cost, and more importantly, would this new addition to your property actually increase its value if you decide to sell? There is no a definitive yes or no answer to these questions, it all comes down to each and every particular example and experts at SoCal Custom Pools and Spas will tell you why. What kind of spa or pool would you like? You can choose between two types, a built-in or above-ground one. It is worth noting that building just any pool is not enough, you also have to pay close attention to which materials are used, the surroundings, lightning, privacy, in other words, the presentation is maybe more important than the pool itself when it comes to determining the price. Built-in pools and spas are winners since they bring more value to the property simply by looking more attractive than the above-ground ones, and people can even opt to follow up with a certain theme that goes will with the rest of the house thus increasing the uniqueness of the place. Same rules can apply if you are trying to decide between an in-built spa and a hot tub. It would be smart to choose an in-built spa, especially if you plan to make it look impressive and turn it into one of the core elements of the property. The spa and the surrounding area need to be specifically decorated with natural materials to complement the whole exterior. On the other hand, a hot tub is considered nothing more than a personal belonging sold along with the house. You are not finished when you become a pool owner, there is the regular maintenance that can cost up to 300 dollars a month. This is one of the concerns you need to think about because not everyone is going to be thrilled about it. You can maintain it yourself if you have enough time and will to do it, but hiring professionals surely makes it easier. If you see the pool as just another chore in the house than maybe you should reconsider building one. Some form of danger is always present around any given pool, especially if you have young children. You need to keep your eyes open and make sure they are not using the pool unsupervised. It’s worth taking the time to explain to them that they can’t go inside when there are no adults present. If that doesn’t work, then you’d need to put some fences for their own safety. Noise can also be a bit problematic especially if neighboring houses are close. How big is the added value and does it actually pay off? There is no concrete answer here, it depends on a few factors. If the property is closer to the city center, where space is kind of scarce, people are less likely to want to waste it on a big backyard pool. Value is certainly increased if it’s a house in suburbs with more comfort. As mentioned above, it also depends on the type of pool or spa, and if any special materials and techniques were used so that the pool can be viewed as a complement to the landscape. 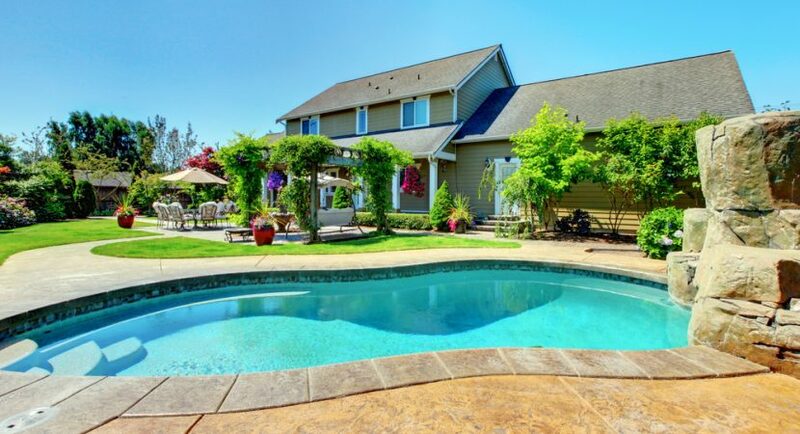 Price varies, but if it is determined that value of a house is increased by adding a pool or a spa, then you could probably earn around 50% more money than you spent building it.